CPOL determines the polarity of the clock. The polarities can be converted with a simple inverter. CPOL=0 is a clock which idles at 0, and each cycle consists of a pulse of 1. That is, the leading edge is a rising edge, and the trailing edge is a falling edge. CPOL=1 is a clock which idles at 1, and each cycle consists of a pulse of 0. That is, the leading edge is a falling edge, and the trailing edge is a rising edge. 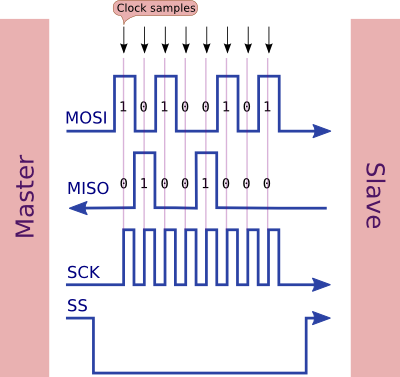 CPHA determines the timing of the data bits relative to the clock pulses. It is not trivial to convert between the two forms. For CPHA=0, the "out" side changes the data on the trailing edge of the preceding clock cycle, while the "in" side captures the data on (or shortly after) the leading edge of the clock cycle. The out side holds the data valid until the trailing edge of the current clock cycle. For the first cycle, the first bit must be on the MOSI line before the leading clock edge. An alternative way of considering it is to say that a CPHA=0 cycle consists of a half cycle with the clock idle, followed by a half cycle with the clock asserted. For CPHA=1, the "out" side changes the data on the leading edge of the current clock cycle, while the "in" side captures the data on (or shortly after) the trailing edge of the clock cycle. The out side holds the data valid until the leading edge of the following clock cycle. For the last cycle, the slave holds the MISO line valid until slave select is deasserted. An alternative way of considering it is to say that a CPHA=1 cycle consists of a half cycle with the clock asserted, followed by a half cycle with the clock idle.